Railroads are well known to have tamed the West and spawned the country’s expansion during the 19th century. The railroad was equally important in the development of southern Florida during the late-19th and early-20th centuries. With the destruction of a portion of Flagler’s rail in the Florida Keys in the Labor Day hurricane of 1935, along with the advent of commercial aviation and the ubiquity of the automobile, private rail service on the Florida East Coast line last ran in the early 1960s. 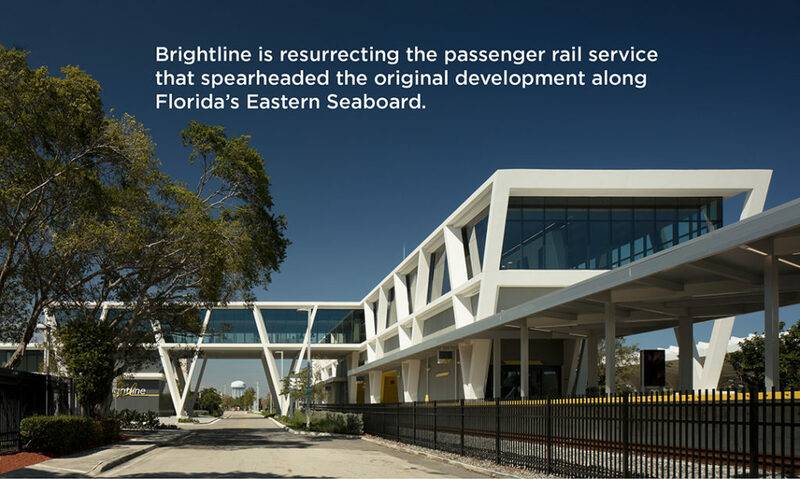 Developing Flagler’s pre-existing trainway through the most densely populated urban centers of Florida’s southeast corridor has been a dream of regional planners for decades. With the increasingly important role Orlando has been playing as a hub for tourism, travel and conventions, connecting central and southern Florida has become all but a necessity. Although controversial in some areas along the trainway’s path, what is incontrovertible is the desperate need for alternative transportation modes in South Florida, an area subject to increasingly stifling automotive traffic and a lack of efficient options for travel between urban centers. It has been proven that increasing the number of highway lanes will not necessarily lead to decreasing travel times, so connecting major urban centers via rail could be an effective way to alleviate highway use and congestion. The development of a 21st-century train transportation system requires incorporating highly interconnected tasks: trains, tracks, controls, fencing, and rail crossings were undertaken as nearly simultaneous endeavors as the design and construction of the stations were underway. As the 19th-century model helped demonstrate, the accessibility of train stations and terminals within or adjacent to a city center leads to a truly intermodal transportation hub. The heart of any effective city requires true intermodal nodes, connecting rail, car, bicycle, taxi, ride-services, pedestrian walkways, and urban transit. The scale of these stations differs from a typical airport experience, as the stations are more closely integrated with their surroundings, creating a more comfortable and intimate space with shorter waiting periods and the ability to be a part of the urban experience. The goal set forth by the owner and lead designers was to convey a simple, contemporary and iconic image evoking dynamic movement. The V-columns, with articulated facets changing the apparent depth of the columns relative to the viewer’s perspective, were chosen to aesthetically express the strong structural frame necessary for a grand public edifice — reminiscent of traditional municipal train stations while not overwhelming the pedestrian scale that constitutes the contemporary urban fabric. Concrete was selected not only for its inherent strength and fire-resistant characteristics, but also to continue the language of South Florida’s architectural vernacular. The station’s multiple-faceted V-column that looks different depending on one’s relation to it was challenging to design and build. It was, nevertheless, conceived, designed, engineered and built within budget and schedule. In addition to the planning and design teams, the ownership group maintained consistent branding and visual communication with teams of world class interiors, wayfinding, landscape design, lighting and graphic designers to create a continuity of passenger experience between web presence, navigating through the stations, the train ride itself, and the final arrival point. 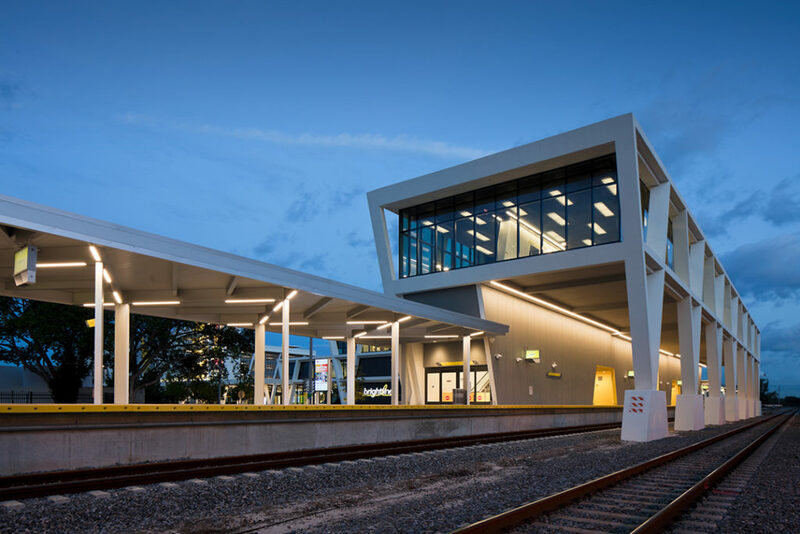 Like the airports in which we often travel, the Brightline intercity passenger rail stations accommodate modern travel conveniences with spacious lobbies and comfortable, contemporary concourses. Unlike airports, however, the passenger holding areas have separate child play areas, open seating loaded with charging stations and integrated wi-fi, and healthier food and beverage selections (updating the ubiquitous fast-food cafe). The passenger experience was created with attention to architecture, structure, interiors, wayfinding and graphic design, all of which came together to form a continuous bright yellow path leading people through the station to the concourse, platform and train car. 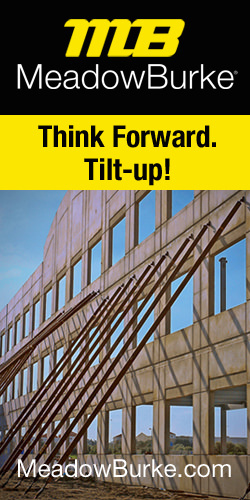 For a variety of reasons, tilt-up construction was decided upon as the methodology for the station’s superstructure. Aside from the economy of cast-bed formwork that tilt-up construction employs, the site area perpendicular to the trainway was ideally suited as an area for casting beds apart from the construction site, allowing for foundation and site construction while the super-structure was being cast. The passenger train station construction had to accommodate the ongoing freight train traffic with as little disruption as possible. The linear progression of erection from furthest to closest casting beds gave tilt-panel construction an edge as the most feasible choice for superstructure construction for these stations, allowing rail traffic to continue unabated. This structure does not appear as a typical panelized tilt-wall assembly. 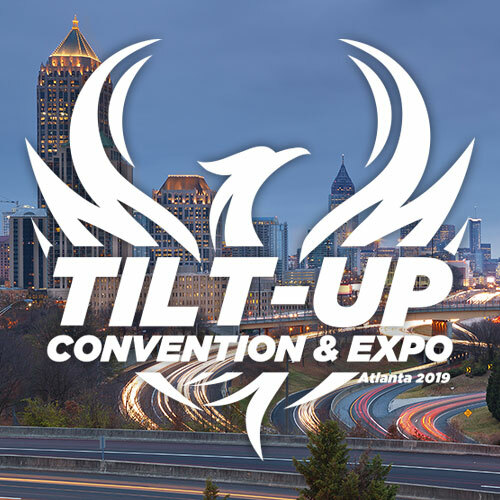 The slender appearance of the trapezoidal sections of tilted columns and corbelled beams was carefully engineered and reinforced to provide the moment connections more typical of cast-in-place concrete construction. This achievement came through a cooperative effort by the architectural design teams, the engineering design teams, the owner, the construction manager, and their subcontractors, The tilt-wall contractors and their specialty engineers limited the height of the panels to two of the three stories, with the upper panels aligning accurately over each of the lower columns to achieve the clean lines necessary for the delicate filigree of the structural frame to succeed architecturally.